While Paul and Silas were at Macedonia, they met with a woman called Lydia. Lydia was a faithful believer who lived in Thyatira. While Paul was preaching there, Lydia heard the gospel and she opened her heart to receive it. Then Lydia and all her household were baptized. And Paul stayed at her house for a few days. Paul was disturbed by what the fortune telling slave woman said, and he rebuked her, saying, “I command you evil spirit of fortune telling come out of her.” The evil spirit of fortune telling came out of the woman. But when her masters found out what Paul had done, they were very angry because they couldn’t use the slave woman to earn money anymore. They caught Paul and Silas and tugged them away to the magistrates. So the people came against Paul and Silas. The magistrates tore his clothes off and gave command that Paul and Silas be beaten. After that, the magistrates throw the apostle, Paul and Silas into the jail and chained their feet. The apostle, Paul and Silas don’t care that they are chained and put in jail. They kept singing hymns to praise God and praying at the jail and the prisoners heard them. All of a sudden, the ground shook violently and the chains that bound Paul and Silas and every prisoner were opened. When the prison guard awoke from his sleep, he saw that every door of the jail was opened. 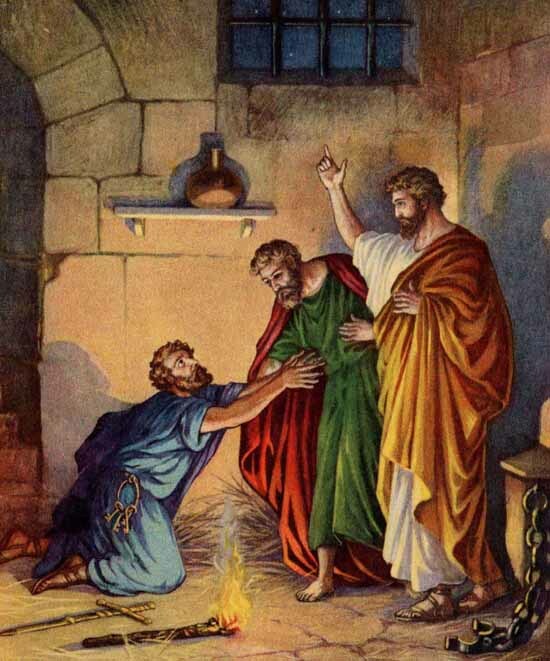 The prison guard knelt down before Paul and Silas. He took everyone out of the prison. That very day, the prison guard and his entire household accepted the Lord Jesus Christ as their Savior and they were baptized. The prison guard served them foods. Everyone was very happy. The next morning, the magistrate sent his men to give the command to free Paul and Silas. But Paul refused to leave unless the magistrates come to tell them to go. The magistrate was very frightened when he found out that Paul is a Roman citizen so he came and begged Paul to go and Paul left the city.